Lemon Cream Puffs are the zingy, summery and creamy version of the original! Stuffed with an easy lemon cream puff filling. SO delicious! Preheat oven to 425 F. Line 2 lightly colored baking sheets with parchment paper and set aside. For the pate a choux: combine the water, butter, and salt in a medium-sized saucepan. Place over medium heat until the butter has melted. Then increase heat to high and bring to a rolling boil. Remove the pan from the heat, and add the flour all at once, stirring vigorously. Transfer the mixture to a bowl or the bowl of a stand mixer, and beat in eggs one at a time. It'll look curdled, but when you add the last egg it should become smooth. Beat for at least 2 minutes after adding the last egg. Using a generously filled tablespoon cookie scoop, drop the thick batter onto the prepared baking sheets in 3- to 4-tablespoon mounds. Space the mounds about 3" apart, to allow for expansion. Bake 15 minutes, then reduce oven temperature to 350°F and bake an additional 25 minutes, until pastries are a medium golden brown. Don't open the oven door while the pastries are baking. Remove the cream puff shells from the oven. Make a small slit in the top of each, and return to the oven for 5 minutes. This will allow the steam to escape. Place them on a rack to cool. When they're cool enough to handle, split each in half to make top and bottom pieces; splitting and exposing the centers to air will help keep them from becoming soggy. For the lemon filling: Mix lemon pudding, heavy cream and milk together to combine. Then beat for 2-3 minutes until light and fluffy. Stir in vanilla, lemon zest and sugar. 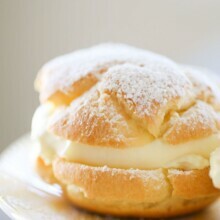 Fill each cream puff generously with filling and sprinkle with powdered sugar.